looking for a daily vegan lunch special that will fill your belly up with satisfaction and play nice with your wallet? 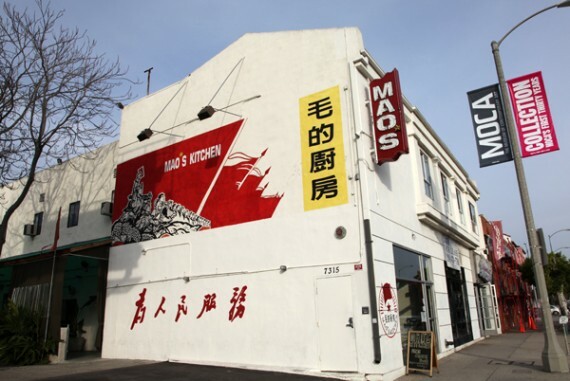 well look no further than mao’s kitchen on melrose. the starkly designed communist china-themed restaurant (sounds weird, i know) offers an extremely delicious and vegan-friendly menu. and everyday from 11am to 5pm, you can have your pick of several different 3 course animal-free lunch specials for just $7.50. 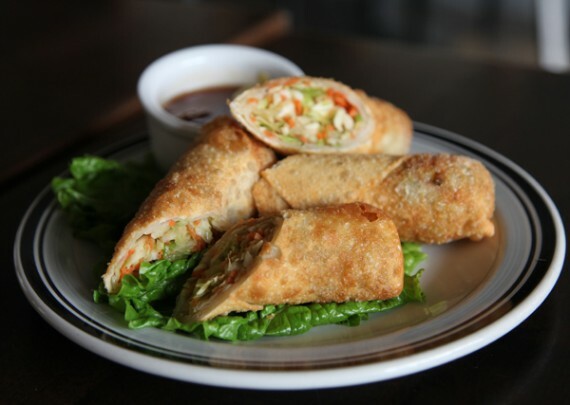 what you get when you order the lunch special, is a scaled down version of any entree from mao’s menu…plus your choice of 2 of the following: soup, salad, or bejing spring roll. we tried out this meal deal over the weekend, and left mao’s completely stuffed and less than 20 bucks poorer. vegan great harvest soup: pureed vegetables, brown rice, herbs. 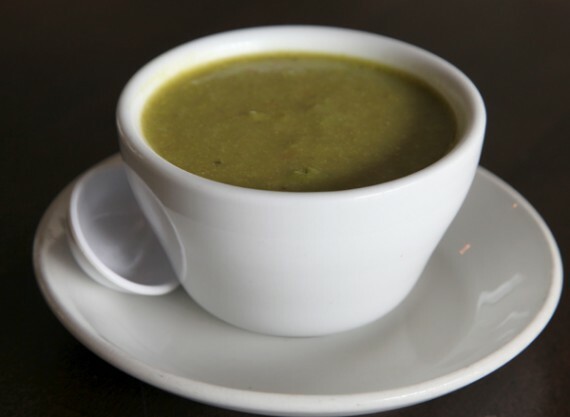 i started with a cup of vegan great harvest soup…a rich blend of vegetables, rice and herbs. this stuff has so many complex flavors going on; it would have to be one of my favorite soups in LA. i’m not sure exactly what they put in it, but it’s super warming and satisfying. 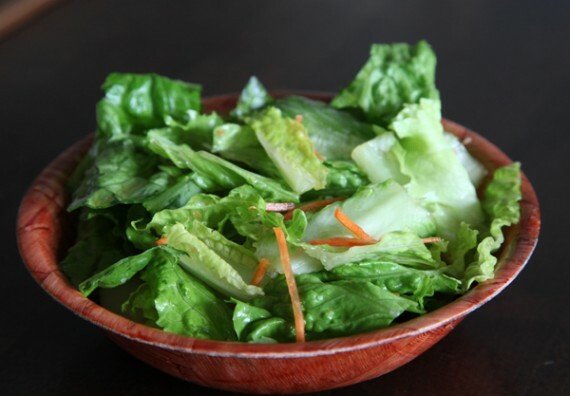 salad: lettuce, cucumber & shredded carrots with our sweet & light vinegar-soy dressing. rather than soup, my husband went with the salad option. it came with cool crisp leaves, fresh cucumber and carrot shreds, all mixed up in a soy dressing. it was light, refreshing, and definitely tasty…but i don’t think it comes close to the awesomeness that is the great harvest soup. we both chose the vegan beijing spring roll with our lunch special, so that’s a double order you see pictured above. each roll was cut in half, shoved full of grated vegetables, and deep fried to perfection. it was so rich, i couldn’t even finish mine. long march camp fry: chinese cabbage, snow pea, tomato, wood-ear mushroom, white mushroom, zucchini & bean sprouts. for my entree, i ordered the long march camp fry with smoked tofu. i tried this once and have ordered it every single time i have been to mao’s since then—i love it so much! it costs an extra dollar to add smoked tofu, but man it is so worth it. the best thing about this dish is they mix in a generous amount of delicate and flavorful wood-ear mushrooms. i could eat an entire plate of the mushrooms just on their own. 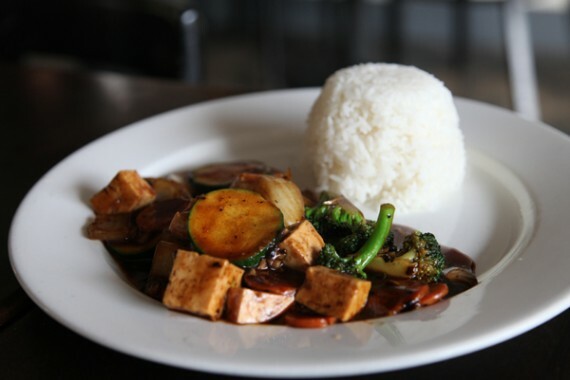 black-bean: soft tofu with broccoli, zucchini, onion, mushroom & carrot in a hearty garlic black-bean sauce. my husband went with the black bean entree with soft tofu, a blend of garlicky black bean sauce and lots of vegetables. also a really excellent choice, this came with lots of crunchy broccoli and soft zucchini rounds. 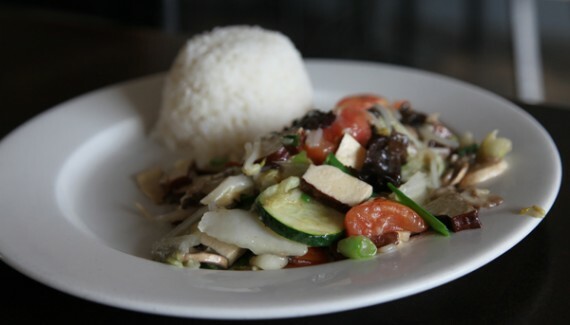 as with all the dishes at mao’s, be sure to specify that you want them prepared vegan. most of the vegetable ones are vegan by default….but you’d hate to get stuck with an animal-containing sauce by accident. i’d say it was right on the money. 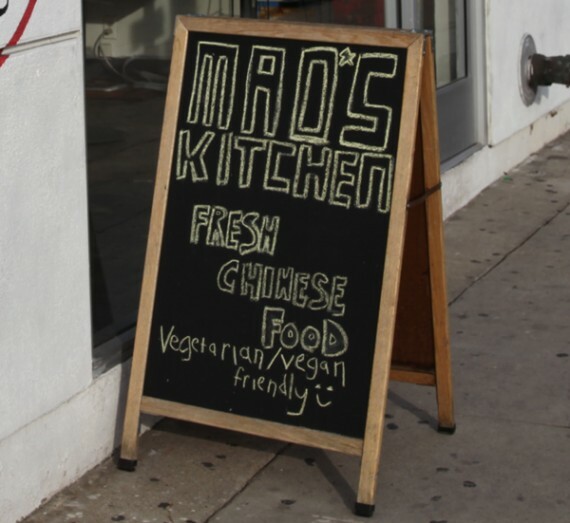 so next time you want to fill up on lunch for under ten dollars, check out mao’s kitchen on melrose. 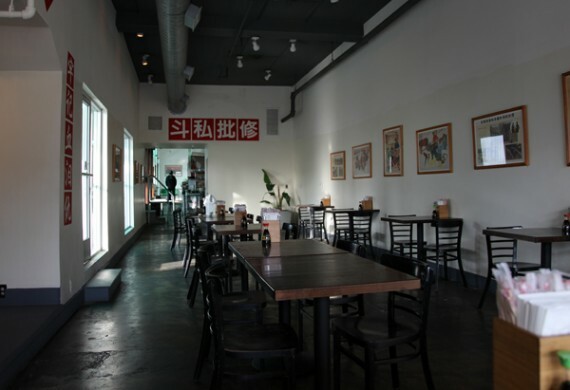 tasty, clean, affordable chinese food in a place that has the word “vegan” all over the menu. gotta love that! mao's even has its own parking lot! PS: this place also has free wifi! PPS: there is another mao’s kitchen in venice which has the same menu…but i’m not sure if they do discounted lunch specials. Ahhh! Mao’s! Never been to the one on Melrose, but am enjoying my leftovers from the Venice location today for lunch. Long March Campfry is also the only thing I’ve ever ordered, with the smoked tofu! Yum, yum, yum!!! They’ll make the hot & sour soup vegan if you order a large (just leave the egg out). It’s awesome! I really like Mao’s. I order the Sichuan eggplant (vegan sauce, naturally) with soft tofu lunch special. They deliver to my office which makes it even better. This is available weekends, too? That’s the only time I’d be able to make it. What kind of dumb weirdos choose a “Communist China” theme for their restaurant? I wrote on your last mao’s post- avoid the cookies, they are not vegan, but we all love fortunes no? @Greg, yep it’s available on weekends!